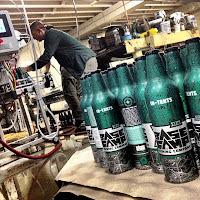 Base Camp Brewing is possibly the newest kid on the brewing block here in Portland. I say possibly because they opened a couple of weeks ago and something newer may have already opened. That's the nature of things in the brewing community here. You may wonder why Base Camp is located where it is over on Southeast Oak. 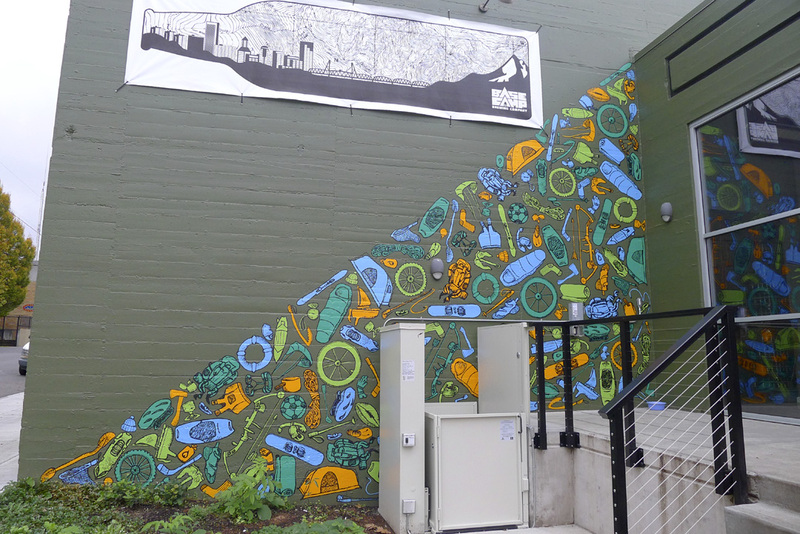 Why would they open a production brewery and tasting room in a bombed out part of the city? Think I'm kidding? Go over there and note the number of dilapidated, crumbing buildings. And homeless campers. I suspect the location was chosen for a logical reason, which I'll get to. 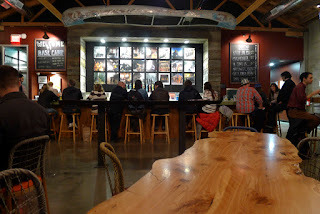 First, you need to know this place is the brainchild of owner and brewer Justin Fey, who previously worked at Klamath Falls Brewing and Pyramid Brewing. Justin is a smart guy. When he was in school at Oregon State University, he bailed on Pre-Med to study Fermentation Science. Brilliant. Really. 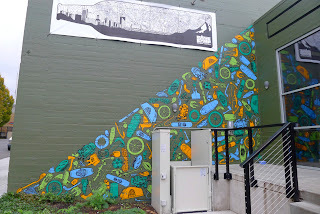 The Base Camp model is virtually unprecedented in Portland. Most places start small. Not Fey. He bought a vacant building in inner Southeast fully intending to install a 20 bbl production brewery there. He then put together a team that helped make it happen. No one, to my knowledge, has ever started out like this here. The closest approximation is Gigantic, which has less brewing capacity and is located far from the city's inner core. 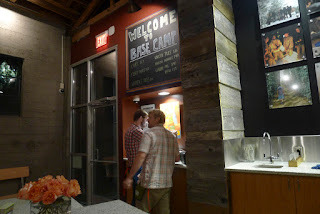 Base Camp's brewing capacity is an interesting story. Fey purchased the entire brewing system from Nicolet Brewing of Florence, Wis. He and his team then traveled there, disassembled the system, loaded it on trucks and brought it back to Portland. They subsequently refurbished and reassembled the pieces. Seriously. I never saw the building prior to Base Camp being open, but pictures over on The New School blog tell the story. The space surely housed some kind of early 20th century industrial enterprise. The ceilings are high, the space cavern-like. Yeah, it's almost ideal for a production brewery. They've dressed the space up nicely with artwork, salvage wood tables, track lighting and fixtures. It's quite comfortable inside. There's also an outside area with a fire pit on the west side of the building...which gets some action now and will surely be very popular when the weather cooperates. It could use a cover in winter, but I don't know if that's in the cards. Back to the brewery. The 20 bbl system is augmented by a generous complement of 60 and 30 bbl fermenters, as well as two large lagering tanks. That kind of fermentation space is rare in established craft breweries, let alone newbies. The lagering tanks, well, they aren't common at all. These tanks give Base Camp a lot of production flexibility and help explain their beer list. Beer geeks are fully aware of why the lagering tanks are a big deal. Since not everyone is a beer geek, a bit of explanation. A prime reason most craft breweries don't produce much if any lager beer is they don't have the fermentation space. 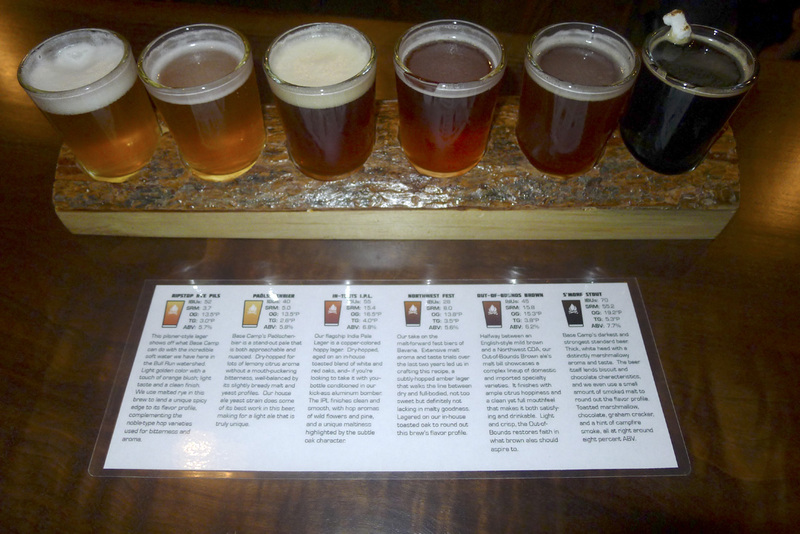 Lagers can clog up a brewery that has limited fermentation capacity. Why? Because lagers take longer to ferment...and require lower fermenting temperatures. So craft brewers have historically steered away from producing a lot of lager. Despite the fact that Budweiser, Coors and the rest of the macro crowd has damaged the integrity of lager beer, there are many great lagers out there. 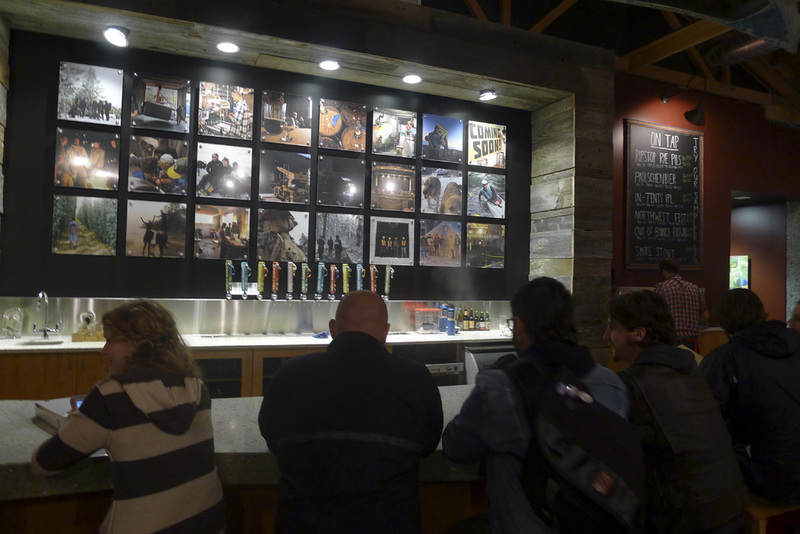 A growing number of craft brewers are reviving the style and Base Camp, which produces plenty of ales, too, is part of that community. I'll be interested to see how it works out for them. Remember, the main goal here is distribution by bottle and keg. That's pretty much the way it is for production breweries that aren't connected to a pub or collection of pubs. 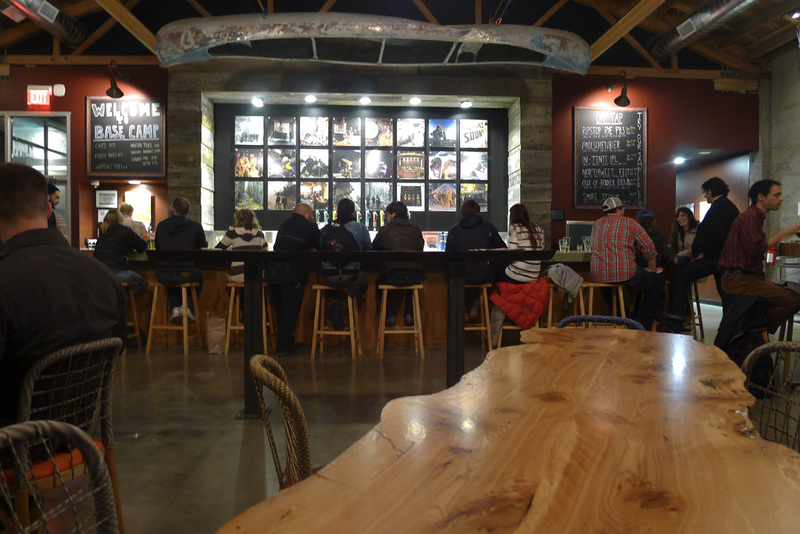 Base Camp's tasting room would never come close to utilizing the brewing capacity here. And I mean never. Their flagship beer is In-Tents IPL. Yup, it's an India Pale Lager. 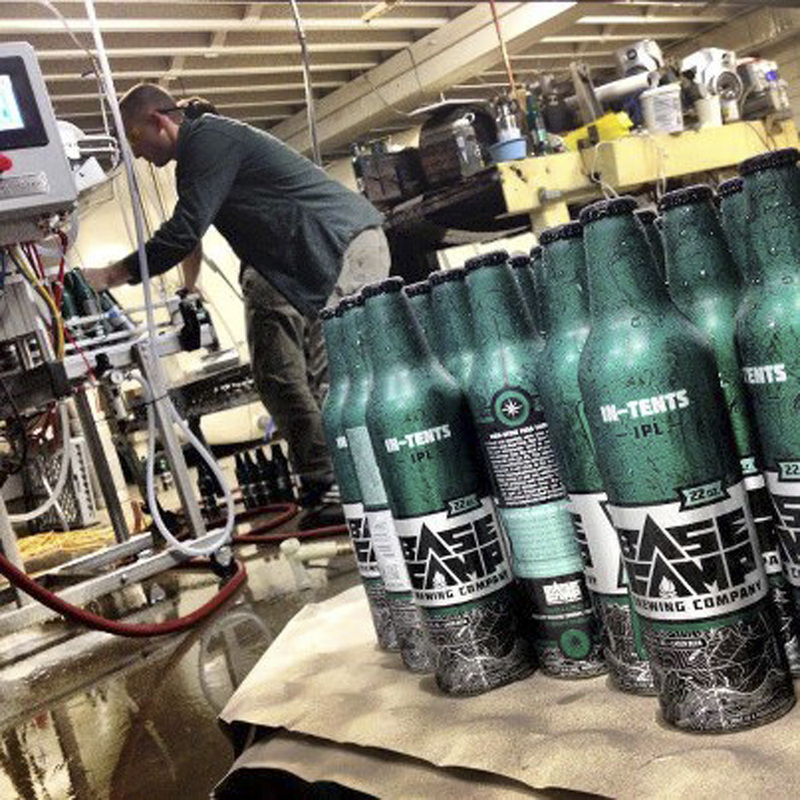 You can find it in area stores in fancy 22 oz aluminum bottles and on draft at various pubs. IPL is an interesting beer. It's dry-hopped and aged on toasted oak chips. It's closer to a red, really. I didn't detect much hop aroma of flavor, likely due to lagering. I think this beer would be better as an ale. But it's pretty good as is. Ripstop Rye Pils had just gone on when I visited on Thursday night. This is a light colored lager with a serene rye malt backbone and a wonderful flavor and finish. RRP was the best beer I tasted and I recommend it highly. Nicely done, folks. Out-of-Bounds Brown Ale is a bit of an odd duck. This beer is lighter than it should be for a brown. It's also heavy on the up-front hops and lacks the kind of nutty, malty depth you expect in a brown. I guess that explains the Out-of-Bounds name. This is actually a decent beer, but it's more of a hoppy winter seasonal (comparable to Full Sail's Wreck the Halls, maybe) than a standard brown. I'm not much of a stout fan, but the S'more Stout is really good. It's quite smooth, yet retains plenty of toasty malt and chocolate flavors. You'll understand the naming convention if you visit Base Camp. It has to do with a marsh-mellow. And a propane torch. Cool stuff. When you make your first trip to Base Camp, do the taster log. The presentation is nice and you'll get to experience the spectrum of what their beers are all about. You'll find something on the log that turns your crank. Trust me. Returning to the issue of location, it likely ties in with how the operation was financed. There are no private investors or shareholders in Base Camp. Instead, the business is built on a bank loan Fey was able to obtain. I can't even imagine what it must have cost to buy a building (even in this area), purchase the brewing equipment and fixtures and get the place ready for business. I'd guess a small fortune. If you're going to do that, it probably makes sense to be in a centralized location where you can draw customers from all corners of the city. So that's where they are. Also related to the financial arrangement is the food arrangement. There's no food at Base Camp. You can order pizza from a cart that resides on the property, but it isn't technically connected. Had they wanted to be a brewpub, they likely would not have qualified for a loan. Why? Because lenders love breweries and hate restaurants (regarded as high risk) in our present economy. I'm not making this up...a well connected and successful industry source told me this a while ago. 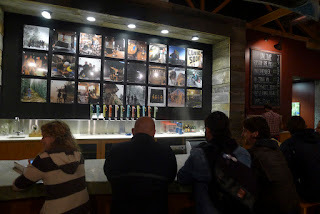 Base Camp, like most of our local breweries, is worth a visit. Do yourself a favor and check the hours before you head over there. Evenings are good, but daytime hours are more limited. Thanks for the write up, Pete. Lots of great and very interesting information especially regarding the background and financing (or lack there of). As for the beer, I think their Paloschbier and Stout are the best.